Shimano introduced the more affordable version of their electronic shifting system this fall - Ultegra Di2. Shimano Canada offered Canadian Cyclist an early sample for some long term testing, and we have started by having Canadian cyclo-cross racer Peter Morse put it through its paces on the 'cross circuit this fall. Once the 'Cross season has finished we will install it on a road bike and keep the testing going. Peter did our earlier test on Dura Ace Di2 to see how suitable the electronic system would be for 'cross use (see April 12/11 11:33 am - Shimano Di2 - Does It Work for 'Cross? We Test a Di2-equipped Ridley X-Fire), however, this time he will actually get to use it for a full season of Canadian 'cross racing. In addition, he will be using Shimano's new cyclo-cross crank and cantilever brakes, which answered some of the concerns that he had previously. Peter's initial impressions of building up one of his 'cross bikes with Ultegra Di2 are below. 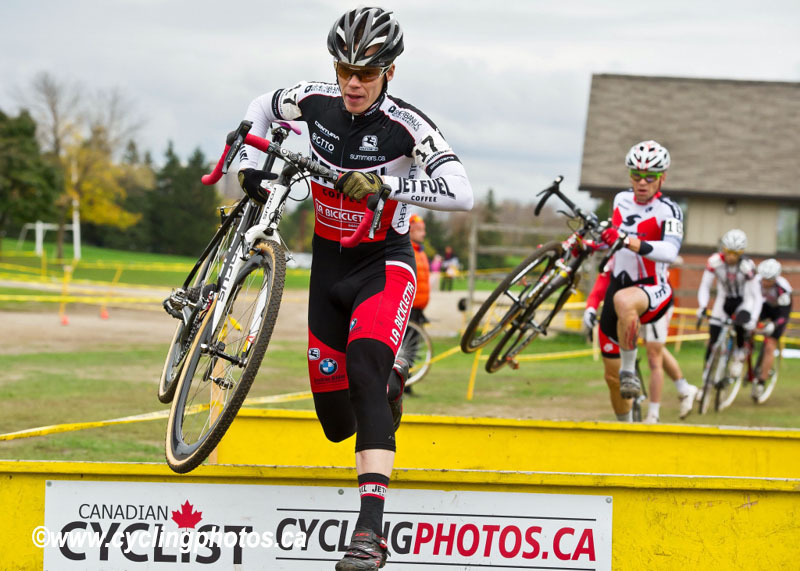 He raced it for the first time at the Toronto 'cross weekend (October 15-16), and will provide a follow up on racing with the system after the Nationals. Installing the Di2 components is the same as mechanical groups. The only differences are the derailleurs and electric cables. To install the wires from the shifters to the derailleurs Shimano has two options, internally and externally. For this test we are using externally mounted cables. Two cables are routed from the levers, under the bar tape to join in the middle where a junction is. 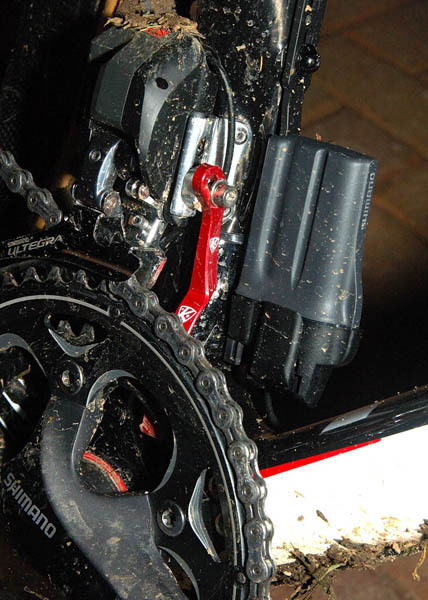 This first junction (Junction A) is a small box with a battery life display and derailleur set button. It is conveniently attached to the front brake cable with zip-ties. The cable then goes under the BB and attaches to Junction B, a box with four wire ports, this is attached to the frame with a bolt where a BB cable guide would be. One goes to the battery, one to the front derailleur, and one to the rear derailleur. Cables are installed with a supplied tool that carefully pushes the cable into the terminal. All cables are attached to the frame with zip-ties and strong, sticky tape. The tape has a non-sticking channel down the middle for the wire to run through. It will be interesting to see if it can withstand muddy cross conditions and the repeated washings common to cyclocross racing. The wiring kit comes in different sizes for different sized frames. The medium size cable kit that was supplied did not have enough slack for the rear derailleur. It still works, but with extreme positions of the rear derailleur the cable will become taut and pull out (it happened to me once, on the first hard, bumpy ride). I recommend the large kit for all cyclocross bikes to fit to the longer chainstays (Shimano subsequently supplied the large kit). The battery can be installed on the seat-tube or down-tube. I chose to mount it on the seat-tube so as not to interfere when lifting the bike by the down-tube. Charging takes 90 minutes maximum. Out of the box it took less than an hour to charge. For Dura-Ace, the bike can be ridden for approximately 1000 km on a full charge. For Ultegra, the riding distance is expected to be shorter. (Approximately 30% less according to tests carried out by Shimano). To set the derailleurs I needed to check the tech docs on Shimano's website. It is quite simple, though it would be good to have paper instructions supplied with the parts. A great feature with the system is the protection function. 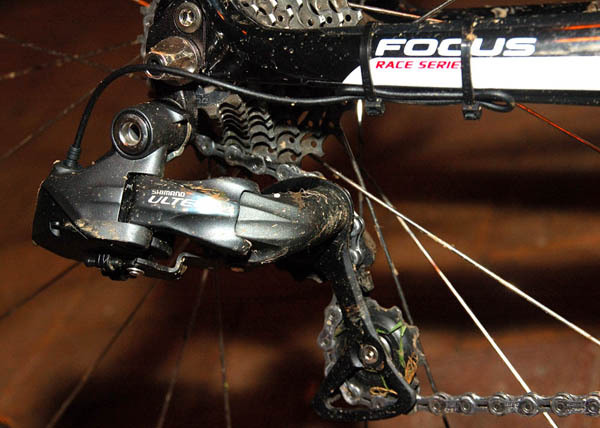 If you pull a wire out, or there is a sudden impact to the bike, the rear derailleur stops in the gear it was last in. You can re-set the system by holding the set button for five seconds. Another note is the front derailleur is the brains of the system. Since you cannot run the Di2 without the front derailleur, single ring set-ups are redundant. Included are a couple of metal derailleur guards you can use to protect the frame from the front derailleur when in the small ring. They have a sticky backing and attach on the seat-tube where it could be possible to shift the derailleur into the frame. Shimano warns users to watch their fingers around the front derailleur, once it starts moving it doesn't stop until the shift is made. The system is waterproof. I read that Shimano even submerged a Di2 bike and it still worked while under water. They recommend not using pressure washers directly on the parts and keeping all terminals dry. The Shimano FC-CX70 crankset is Ultegra level quality. It has compact rings, 36 tooth and 46 tooth, a good combination for cross. 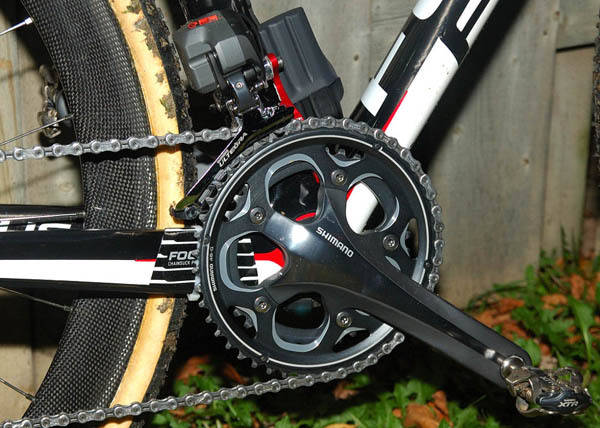 With the 11-28 Ultegra cassette it provides a wide range of gears. 36-28 is a low gear combination that can get you up most hills that are rideable in cyclo-cross. 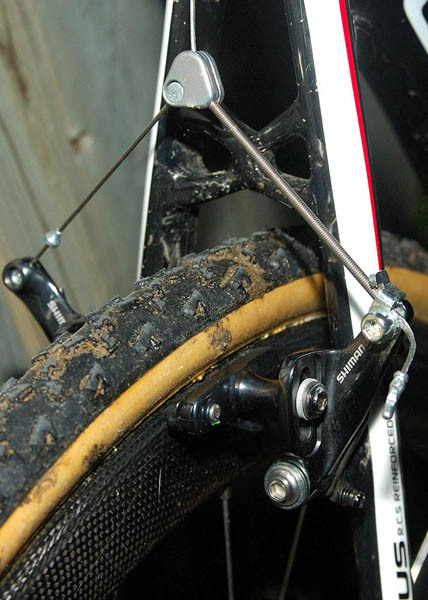 Shimano has new cyclocross brakes, the CX70 Cantilever. They have a low profile and there is a lot of clearance for mud. The cross-over cable uses the simple and effective one-bolt design of past Shimano brakes. The pads are easily adjusted by a swivelling spacer/pad holder. They are supplied with enough spacers to accommodate the wide range of rim widths and the various brake boss widths encountered on different frames. The road pads used will be easily changed for carbon or aluminium rims. The Ultegra clincher wheels are not cyclo-cross specific, but they lend themselves well to the discipline. The rims are robust with a high side-wall and thick brake track. They should last a long time under the hard and gritty (from dirt) braking of cyclo-cross. They are tubeless compatible, and the lack of a rim-strip means less water in the rim and less parts to replace. They ride comfortably, probably due to the lower spoke tension compared to many factory built wheels. Truing is easy with the supplied spoke wrenches. For 'cross racing tubular wheels and tires are best, so these will serve as good wheels for training, for me. It was raining and muddy. Nothing in the Di2 component group was adversely affected by the wet conditions. There was no very deep mud, however. I also rode in sand with no problems. Anatomic hoods felt good to hold, they are big enough to comfortably fit your entire hand. The textured grip is appreciated since this is where the hands are most of the time in 'cross. Smaller handed riders will need to use the built-in lever reach adjustment. The buttons for up and down-shifting are in the most intuitive position, compared with the mechanical groups. They can be reversed if desired with a tuning program you can get for your computer. They are easy to feel and activate, but the lack of a swinging lever means I'll have to get used to them. It's not something you can master on the first ride. I was sometimes automatically grabbing the lever as though I was going to swing it for a down-shift. You have to tap the button repeatedly to down-shift; it's almost as fast as the swing-type shift. The derailleurs feel as fast as Dura Ace but slightly not as smooth. I will try using a DA cassette and see if that changes, maybe Dura Ace chains are smoother too. With Dura Ace I could shift under any load smoothly, with Ultegra there is more of a meshing sound under heavy load before the chain is in the next gear. 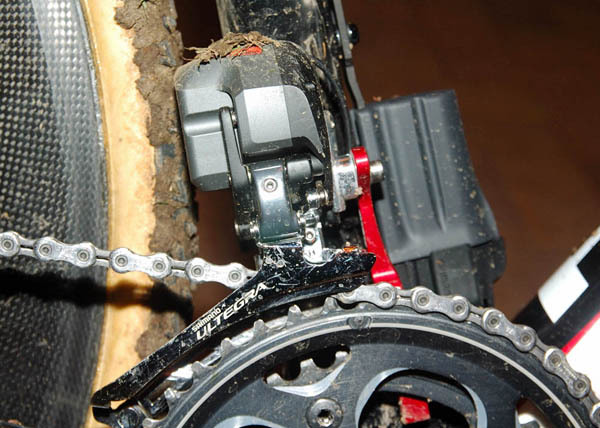 The front derailleur is very strong and did not drop the chain while shifting under load. Up-shifting to the large ring is not as smooth as Dura Ace but still very good, possibly due to the 46t chainring compared to the 50t ring that was on the DA bike I rode. Lifting the bike I could feel the slightly extra weight over Dura Ace. The carbon wheels I use while racing will lighten it. Brakes are powerful and have good modulation without feeling spongy. Wheels are comfortable and not too stiff. The wide gear ratio provided by the 36 / 46 tooth crank and the 11 - 28 cassette was nice to have on steep hills. 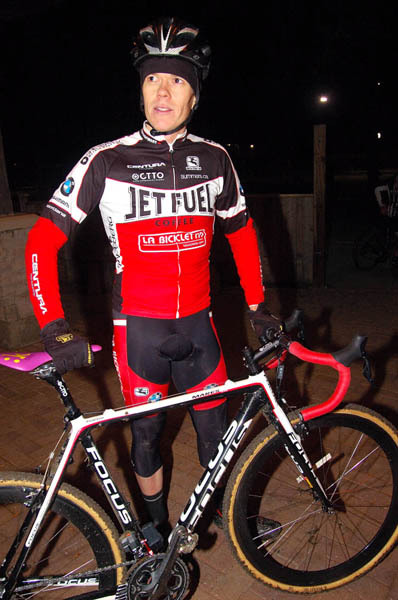 It will be a true test when I race the bike - rain is forecast for the first day of the Toronto CX races.